Just as these are the pages on which this review is written, so are we the pages upon which our karma is written. 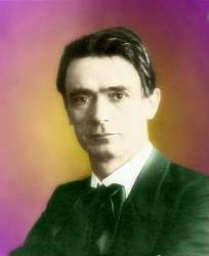 In this book and the seven that follow it (Volumes 2-8) Rudolf Steiner teaches us to read the pages of our karma. It's likely that as few people will read the pages of this review as will read the pages of their individual karma. We all have our individual book of karma, but unless one takes it down from the shelf, opens it, reads its contents carefully, and understands it with comprehension, one's book of karma will remain a mystery. 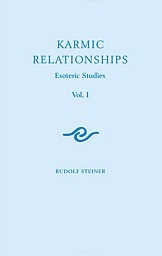 In these esoteric studies as the subtitle calls them, Steiner helps us to comprehend the contents of our book of karma. To help explain this, it will be helpful to consider a couple of examples of unconscious behavior. First consider a simple stage hypnosis example: someone hypnotizes us, gives us amnesia, and while we're under trance, changes one of the shoes on our feet. Later, when we awake we're wearing one black and one white shoe, and we have no explanation for it. That's a metaphor for how we come into this life: we arrive with things that don't seem to make sense because we have no consciousness recall of them happening. Steiner points out that our plans for this life happen during the period between death and a new birth, which is unconscious to us now. Thus he gives us a hint as to why we may have one black and one white shoe on: it was something that we, as the hypnotist, did to ourselves during a period of which we have no consciousness now. In the next example I'm using Jane Roberts' experience channeling Seth and her husband's shorthand notes as a metaphor to make a point about encrypting and decoding as it applies to our ability or inability to read our individual book of karma. I could have used any other trance metaphor, but I wanted a writing one. When I put the words "deep trance" in italics I do so to point out that I'm not talking literally about a trance state, but trance as a metaphor for our unconscious condition [to us now] of our state between death and a new birth. The pages of karma are written while we are in a deep trance, similar to that of Jane Roberts when she channeled her Seth books. Only after her husband Robert Butts had transcribed his shorthand notes into typewritten pages, could Jane read what Seth had said aloud using her body as his instrument. Jane couldn't read Robert's shorthand, so she needed help, a translation into typewritten form before she could comprehend Seth's words. This is a very apt way of describing how the results of one's previous lifetime have survived into one's present life. Sealed into the crypt of one's living body is the dead body of our past deeds in previous lifetimes. Just as an architect's drawing for a house is dead — not a living thing, but mere stationary scratches on paper — so also is the contents of one's book of karma a fixed unmoving recording on the paper of our body. And just as the architect's dead scratches on paper are brought to a living reality by a contractor who, using the drawing and available building materials, constructs a house, so also is the dead contents of our book of karma brought to life by our threefold human aspects of thinking, feeling, and will. When one builds a new house one builds on the experience in one's present house and all the previous houses in which one has lived. One consults an architect and explains one's requirements, and the architect draws up the plans. When the plans are ready, a contractor is hired, and the contractor directs and assists the carpenters in the use of the building material to construct a sturdy, livable house that matches the requirements as you gave them to the architect. Ponder this question: "Will you feel constrained by some perceived loss of free will when you move into this new house?" Consider your answer to this question in relation to your conception of how karma impacts free will. We will return to this question later. Another question: "When you move into this new house, will you be pleased with the new facilities?" Certainly, after all, this new house was designed based on your experience in all your previous houses, using the best architects, contractors, carpenters, and building materials that heaven allowed. You have provided your new house with inner comfort so as to minimize discomfort and provide for your well-being in the house. You have directed your architects to consider the events and experiences you wish to have in the house — and the architects constitute the top of the hierarchy of your Building Task Force, the First Hierarchy. Your contractors are concerned with your likes and dislikes in the building phase. As the Second Hierarchy of your Building Task Force, your contractors focus on your sympathies and antipathies as they proceed with the construction. Next comes the interior decorators who advise you on how to choose the furnishings and decor of your home to maximize your sense of well-being while you're in the home. They comprise the Third Hierarchy of your Building Task Force and are most attuned to your sense of comfort or discomfort. [page 40-41] In this life between death and a new birth you have a strong consciousness of the fact: I have done harm to another man, and I am less perfect than I should be had I not done him harm. I must compensate for it. The impulse, the urge arises in you to compensate for the harm you have done. Or again, if you have done something to another that is for his good, that helps him, then you look upon what you have done and you say to yourself: That must serve to build the foundation for the general good, it must lead to further consequences in the world. All this you can inwardly develop. And it can give you a sense of well-being or of discomfort according as you form the inner nature of your body in the life between death and a new birth. It can lead you to sympathies and antipathies, inasmuch as you build and shape your astral body correspondingly, with the aid of the Powers, Mights, and Dominions. [page 41] All this, however, will not give you the power to transmute what in a former life was merely a human fact, into a deed of the cosmos. You helped another human being or you harmed him. This must entail his meeting you in a next life on earth, and in the meeting with him you will have to find the impulse to balance-out the deed. . . To do so, those Beings are needed who transmute or metamorphose moral deeds into world-deeds, cosmic deeds. They are the Beings of the First Hierarchy: Seraphim, Cherabim, Thrones. It is they who transmute what goes out from us in one earthly life into our experiences of the next lives on earth. They work in the "events and experiences" in human life. Now let's return to the question we raised earlier about free will. 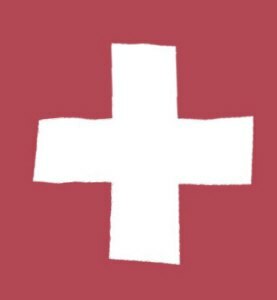 We find that Steiner says that "one should not ask about the freedom of the Will. The Will lies deep, deep down in the unconscious, and it is nonsense to ask about the freedom of the Will. It is only of the freedom of Thoughts that we can speak." (Page 42) And with one's Thoughts one can live freely only in the mineral world or kingdom, for in the plant, animal, and human kingdoms one is subject to destiny (karmic necessity) as shaped by the First, Second, and Third Spiritual Hierarchies. Rightly understood, just as the corpse of one's body is fully in the mineral kingdom, so also can the mineral kingdom be considered as the corpse of Gods (the Spiritual Hierarchy). Steiner says on page 43, "for this very reason, man can live in it (the mineral kingdom) as in the realm of his freedom." Thus comes the paradox of freedom: one can live freely only in the mineral kingdom, but one must also live in the plant, animal, and human kingdoms while on earth and these are subject to destiny or karmic balancing by the Spiritual Hierarchies that pervade them. [page 49] What we are beginning quite consciously with Anthroposophy to-day — the penetration of the spiritual world into the normal consciousness of man — will indeed entail this consequence. Into the world which man lives through death and a new birth, the earthly world will also penetrate increasingly; and yet man's consciousness will not grow dream-like, but clearer and ever clearer. Now consider the three-fold body of the human being in its thinking, feeling, and willing. Begin by letting the image of a human fetus stand before you. What is the prominent feature that strikes you first? The head — for in a small fetus the head is the largest visible structure. The head is the center of our nerves and senses, the most wide awake of our three-fold being. Look closely again at the small fetus shape and the next thing you notice is a red pulsing that pervades the living fetus, centered in the area that will become the chest. What you're seeing is the nascent heart in the chest that will house the rhythmic activity and bodily organs of the human body. In this portion of the body we find the feeling portion of our three-fold being, which is in a sleeping or dreaming state. "Our feelings have no greater intensity in consciousness than dreams." (Page 96) Next, if we observe closely, we find the tiny limbs of the fetus that constitute the willing portion of the three-fold being in its metabolic and motor organism. In the will, in our limbs, we find the most unconscious of our three-fold being. And there is where we find our karma, or as Steiner says, "Karma holds sway in our willing." [page 99] Wide awake consciousness is the condition in which our ideas, our mental presentations, are. Dreaming is the condition in which our feelings are. Deep sleep (even in waking life) is the condition in which our volition is. We are asleep in our impulses of will, even in waking life. In the ontogeny of the human being, the development proceeds from a head-dominated fetus structure to a fully developed mature human body atop which the head sits. Progressing through all the phyla, the tiny one-celled animal that is the fertilized egg is said to recapitulate the phylogeny of all the lower species on earth as its ontogeny is played out in the maturation of a single human being. Ontogeny recapitulates phylogeny. But there is another process of evolution called neoteny in which the normal process of ontogeny is reversed. Instead of progressing to the next stage, juvenile features are retained in adulthood. Neoteny reverses ontogeny. It is thought by some that the future development of the human body will be by neoteny, and this process shows up interestingly in science fiction movies in which human beings from the distant future are depicted as having large heads in proportion to their bodies. Another way of saying this simply is that adult mutants tend to look like younger members of the same species. In 1969 I attended a lecture by a prominent evolutionist, Garrett Hardin, at the Fall Joint Computer Conference in San Francisco. In his lecture he explained how seemingly minor biological changes can have disastrous effects given a long enough time. If we replace human organs, such as hearts, via transplants or mechanical devices, in humans who are still capable of reproduction, while this may be a humane thing to do on an individual basis, the evolutionary consequences are dramatic. Whatever the genetic basis for the defective heart, no matter how minor, the defective genes will survive to another generation. Continued over a long enough time frame the evolutionary consequences are that the typical human being of the future would be a motorized cart carrying a human brain, the only organ we would not be able to replace. It was a chilling picture, and one whose implications society has yet face some thirty years later. Will the future ontogeny of human beings include mechanical replacements for most of our organs and limbs? [page 107] Whether the things we do with one another are good or evil; for all that is good, for all that is evil, the Beings of the First Hierarchy must shape the corresponding counterparts. And it is these counterparts that we experience as Fate, in which "is living what the corresponding Gods, those of the First Hierarchy, had to experience in their domain as the consequences of our deeds." We push the First Hierarchy into trials during this life which they balance and compensate for us in our next life. "Whatever the Gods prepare for us as our destiny in a subsequent life, they have lived it before us." (Page 109) During our life between death and a new birth we look upon a heaven in which the First Hierarchy plays out, lives through, what will be our destiny in our next life on earth. In the latter part of the book, Steiner goes into details of famous men as they progress through several incarnations. Vischer, Nietzsche, Tacitus, Pliny, Emerson, Franz Schubert, and Eduard von Hartmann. He gives a famous quote from von Hartmann who is known as the originator of our modern concept of the unconscious. [page 149] "First there was the religion of the Father, then the religion of the Son, and in the future there will come the religion of the Spirit." In a curious paradox Steiner tells us that our head, which is so important during our earthly life, is of little importance after death because it is the most human part and expends itself during our life. The rest of our body, subordinate to the head during life, becomes more important to us during the inversion that occurs in the spiritual world. [page 150] In his head, man is most of all physical and least of all spiritual. In the other members of his organism, in the rhythmic organization and in the limbs-organization, he is more spiritual. He is most spiritual of all in his motor organization, in the activity of his limbs. Between incarnations there is a switchover that takes place between the parts of the body. What was in the body apart from the head works into the head of the next incarnation, and what was in the will in the head, works into the limbs in the next incarnation. [page 150] A man who is lazy in his thinking in one incarnation will most certainly be no fast runner in the next: the laziness of thinking becomes slowness of limb; and vice versa, slowness of limb in the present incarnation comes to expression in sluggish, lazy thinking in the next. Of Nietzsche Steiner says that "He used to write, you know, sometimes sitting but more often while walking, especially while going for long tramps." This reminds me of how I like to read and write during long automobile trips, usually while alone in the car. The two streams from Asia of the Mohammedans and Turks were defeated by the Crusades, "the struggle waged against them by the warlike Christian population of Europe." What was the result of winning this "war" on the Christian population? The culture of the Mohammedans and Turks was absorbed into the culture of the European people — science, art, architecture, algebra, and much more. Once more we see an example of how a defeat on one level ends up as a victory on another level. In the United States, the Democrats defeated George Bush and the policies of Ronald Reagan in 1992, only to absorb the policies of limited government, elimination of welfare, and balanced budgets as part of their programs. In an interesting book How To Win the Business Battle I first encountered in 1964 the concept that one must choose in business [apparently in other areas of life as well] whether one wishes to implement an idea or get credit for an idea. The author's point is that the choices are mutually exclusive and the irredentist ideasman will quickly learn to give off an aura of someone who could never have an original idea but yet always seems to be around when a new idea pops up. In a rare reference to the Anthroposophical Society, Steiner speaks on the dangers of opportunism, or the sacrificing of one's principles for expediency, like the Democrats in the Senate did in the United States during the 1999 Impeachment Trial of the president. [page 170] Opportunism has, in sooth, wrought harm enough to the Anthroposophical Society; in the future there must be no more of it. And even if things have a paradoxical effect, they will henceforward be said straight out. As for the unfolding of history, Steiner traces ideas as they surface and go underground between successive incarnations of the same human being and says that "we can also speak of a reincarnation of ideas." This concept mirrors R. G. Collingwood suggestion that "All history is the history of ideas." If one is put off by Steiner's continual linking of one person's life to another's, Muavija to Woodrow Wilson, Haroud al Rashid to Francis Bacon, Tacitus to Emerson, etc, we need only consider the simple experiment that Steiner recommends to us: "pluck off a flower from a plant and imagine that it can exist by itself." If we perform that experiment thoughtfully we will come to see that a single human life cannot be understood in isolation any more than a flower makes sense apart from the stem, leaves, and root system of the plant that bore it. All of us in this lifetime are like the flower of our previous lifetimes rising to the sunlight of day in freedom. If we cry in dismay that we are rooted in one place to our destiny, that our leaves are the wrong size or shape, or that our stems are too thick, we must remember that we are the gardener that chose our root stock for this lifetime. May we all soon learn to love our roots and to cherish the freedom and light that infuses our life. Rightly understood, the house we built with the help of our Architects, Contractors, and Interior Decorators is a greenhouse in which we live, love, and have our being.